Mounting concerns over excessive demands for corn as both food and fuel only add to the urgency. In January, President Bush set a goal of producing 35 billion gallons of alternative fuels, probably mostly ethanol, by 2017. But the more than six billion gallons of ethanol that will be produced this year have already helped push corn to its highest price in years, raising the cost of everything from tortillas to chicken feed. Poor people in Mexico have protested against the higher prices, and now China and India are starting to suffer from food inflation. So why has no one figured out a way to make ethanol from materials like the sugar cane wastes engineers are working with here? Petroleo Brasileiro SA, Brazil’s state-controlled oil company, may help upgrade two Brazilian rivers to transport sugar cane-based ethanol from the country’s agricultural frontier to export markets. FOREIGN POLICY: Youâ€™ve written a lot in the past about what would happen if the United States converted to an ethanol-based fuel system for cars. Have your predictions come true? Lester Brown: Most people know ethanol production in this country is growing, but they donâ€™t know how fast. About a year and a half ago, right after Katrina, a trend that had been near horizontal became almost vertical. The capacity of plants now under construction is equal to the capacity of all the plants built in the last 26 years. If the pace of new starts continues from now to the end of June, roughly 140 million tons of corn will be going into ethanol. Thatâ€™s over a third of the U.S. grain harvest, so itâ€™s not trivial. And just to give you a sense of how big the U.S. corn harvest is, the corn harvest of Iowa exceeds the entire grain harvest of Canada. FP: What are the implications of so much corn being used for fuel? The Bush administration has proposed scrapping the current U.S. renewable fuels standard that requires ethanol use to reach 6.8 billion gallons a year in 2010 in favor of a wider alternative fuels requirement that aims to cut America’s foreign oil dependence. Under the legislative proposal sent to Congress on Monday, the new standard would require U.S. ethanol and alternative fuel consumption to reach 10 billion gallons in 2010. The draft legislation calls for a credit, banking and trading program to encourage alternative fuel production.Â The bill authorizes the federal government to sell compliance credits, which are weighted for their energy or BTU content, to make sure the program does not impose unreasonable costs on consumers, Bodman and Johnson said. Producing approximately 5 million tons of citrus peel waste annually, the Florida orange juice industry has the potential to provide up to 60 million gallons of cellulosic ethanol for Sunshine State residents…Although 60 million gallons of cellulosic ethanol per year would not even come close to satisfying U.S. fuel demand, this hasn’t stopped companies from seeing the economic and environmental benefits the technology would offer consumers on a regional scale. The citrus waste, a pectin, cellulose and soluble sugar rich mixture of peel, segment membranes and seeds is available at no cost and in large volumes with potentially no transportation costs since companies like Florida-based Citrus Energy LLC, and newly incorporated Southeast Biofuels, plan to build biorefineries in the local vicinity or co-locate at the citrus processing facility itself. Currently, citrus waste from orange juice processing companies is dried into citrus pulp pellets and fed to cattle with little or no return on investment. In addition, during the drying process toxins are released requiring citrus processing companies to install costly equipment to ensure that organic emissions do not escape into the atmosphere. The Oil Drum explains, with a look at how summer temperatures, Reid vapor pressure (RVP), and ethanol affect fuel prices.Â Interestingly, they note the blending of ethanol into the gasoline pool has been controversial because (among other things) it increases the vapor pressure of gasoline blends. This has resulted in the need for a 1 psi waiver in the Clean Air Act for ethanol-containing fuels. This of course means that ethanol will exacerbate smog at certain times of the year, and has resulted in a campaign by Senator Diane Feinstein to limit ethanol blending in California. When the 2007 IndyCar Series season starts up with the Indy 300 at Homestead-Miami Speedway next Saturday, the new Honda engines in the race cars will be running on 100% ethanol for the first time. All 17 races on the 2007 schedule, including the Indianapolis 500, will be run on ethanol. Compared to methanol, ethanol has a higher octane rating (113 to 107), a higher flash point (55.4Âº F to 52Âº F) and a larger energy content (77,000 BTU per gallon to 64,250 BTU per gallon). Driversâ€™ reactions have been enthusiastic. The IndyCar Series jump to ethanol has been great. We are definitely on the right path with ethanol. There is more power with the new [3.5-liter Honda Indy V-8] engine. It runs clean and it is better for the environment. So it is a win-win situation, and that is great for the series. 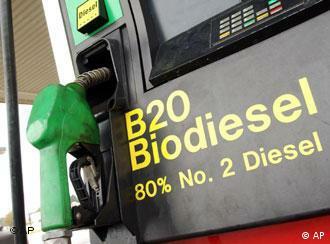 Ethanol is another alternative to gasoline. If we can show that the IndyCar Series cars can run ethanol, then it is good for everyoneâ€™s street cars. High feed costs, created by the explosive growth of the fuel ethanol industry, will lower U.S. beef and broiler chicken output this year by a quarter billion lbs from earlier forecasts, the U.S. government said on Friday. The Agriculture Department said beef output would dip by 62 million lbs and chicken by 124 million lbs from last month’s estimate, with total red meat and poultry production forecast for 90.359 billion lbs. Cattle, hog and poultry feeders say abrupt increases in feed costs — predominantly corn — are squeezing their operations. Undersecretary of State Nicholas Burns said last month that biofuels could become the “symbolic centerpiece” of U.S.-Brazilian relations. The relationship sorely needs such a focus. Differences over farm subsidies were largely responsible for killing the U.S. initiative to create a Free Trade Area of the Americas, and the two have not found common ground in the Doha round of trade talks. But cooperation on biofuels promises economic, political and environmental gains that could go far beyond the benefits of trade deals. Brazil meets 40 percent of its domestic vehicle-fuel needs through ethanol, and it exports less than 20 percent of what it produces. Brazilian ethanol, derived from sugar cane, costs one-third less to make than corn-based American ethanol does and is more environmentally friendly. Just 7 million acres of sugar cane are being grown for ethanol in Brazil, but more than 400 million acres of pasture land — none of it in the environmentally sensitive Amazon region — could be cultivated. Collaboration could also help expand production of sugar-cane ethanol in the Caribbean and Central America, lifting up poor economies that have tariff-free access to the U.S. market. While it will not be discussed openly at this week’s meeting between Bush and Brazilian President Luiz Inacio Lula da Silva, the United States would benefit politically if its allies in Latin America developed alternatives to the massive oil reserves controlled by Venezuela. Hugo ChÃ¡vez’s government is using its roughly $40 billion in annual oil revenue to spread its anti-American influence across the region.